No sooner could he stand on two feet than Roger Street had to be on two wheels, or three or, on occasion, four. An old black and white photo shows young Roger astride a wooden hobby-horse, his face a picture of prescient pride perhaps, for some sixty years later he finds himself at the head of the Dandy Chargers, a coterie no more than two dozen strong of pedestrian hobby-horse enthusiasts. 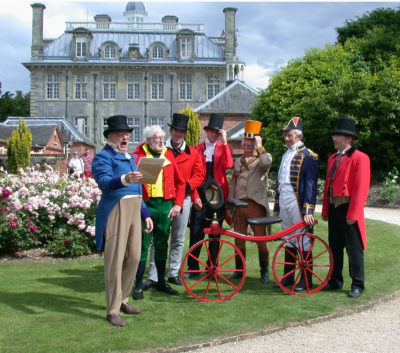 Founded by Roger in 2001, their passion for the wooden-framed pedal-less forerunner of the bicycle so beloved of London’s Regency dandies leads them to gather every few weeks during the summer months to ride their machines in public in period costume, usually at the invitation of a stately home or outside event. ‘Our first ride was at Kingston Lacy and was a very fine affair,’ says Roger, a partially retired solicitor. He has an impressive collection of original Regency hobby-horse prints adorning the walls of his home near Christchurch. These will be exhibited next year in celebration of the 200th anniversary of Denis Johnson being granted the first English patent for the machine. Through his Artesius imprint Roger has published three books on the proto-velocipede – The Pedestrian Hobby-Horse: At the Dawn of Cycling (1998), Dandies: The English Hobby-Horse Craze of 1819 (2011) and Before the Bicycle: The Regency Hobby-Horse Prints (2014) – and now concedes that he has probably exhausted the subject, although his research continues apace and, just a few weeks ago, Roger managed to cause ripples of excitement in hobby-horse circles when he identified a particular machine made by Denis Johnson himself. The membership includes Roger’s other half, Trish, various sons and daughters and grandchildren, including nine-year-old Lola ‘who’s very keen,’ he proudly adds, before going on to explain the CRABS’s longevity in terms of its willingness to embrace change. Roger attained his first ‘ordinary’ (better known as the penny-farthing) in 1970 and rode it on early CRABS rides, or ramshackles, but today’s membership tends to set forth on classic mid-20th century heavy-framed black British bicycles. ‘I’ve recently acquired an electrically assisted bicycle – it’s a joy and not really cheating at all – and formed a sub-section called the CREBS, that’s Christchurch Ramshackle Electric Bike Society,’ Roger tells me. 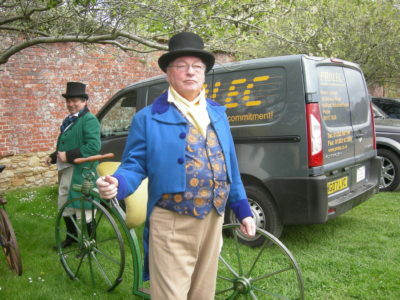 In the grand tradition of British eccentrics Roger has never permitted his day job – ‘It is rather serious, you know’ – either to get in the way of or to be subsumed by his hobby. Not even when he launched Christchurch Tricycle Museum in 1985. Opened by Lord Montagu, it was home to some forty machines in the former Priory brewhouse in Quay Road, where its apposite motto, ‘Multum in Parvo’ (‘Much in little’), still adorns a wall. The ’nineties weren’t good for Roger – he lost the museum and a marriage – but he survived the dark days to retire from full-time practice in 1998 and has since worked two days a week as a locum for Spurlings in Christchurch. In his office, a sizeable collection of hats threatens to topple from the bookcases. He currently favours the French policeman’s hat simply because it stays on his head, but with other more sensible hats on he has also represented Christchurch Conservation Trust as president and from 1975 to 1983 served as a borough councillor. ‘I was elected as a wicked Tory, but being called in for “choir practice” before a meeting – to make sure we were all in tune – didn’t chime with my more individual view of things, so I became an independent and ended up chairing the Policy and Resources Committee. That enabled me to guide through the purchase of the old Regent Theatre as an arts centre for Christchurch and I was the first chairman of the Regent Centre Association and drafted its constitution.